Students find the Sun’s location in the sky for different points in time during an eclipse. They will then use mobile devices to measure lux before and during the eclipse to examine the impact a solar eclipse has on the energy received at Earth’s surface. Safety Note: Do not look directly at the Sun. Do not look at the Sun through your phone’s camera or view the partial eclipse without certified eclipse glasses or a solar filter. For more information on safe eclipse viewing, visit the NASA Eclipse website. Prior to the eclipse, students should find a location at school that will not be shaded by trees, buildings or other objects during the time of the eclipse and will allow sunlight to reach the mobile device unobstructed. Students need to point their mobile device so that the surface with the light sensor (usually the screen side of the device) is perpendicular to direct rays of the Sun. 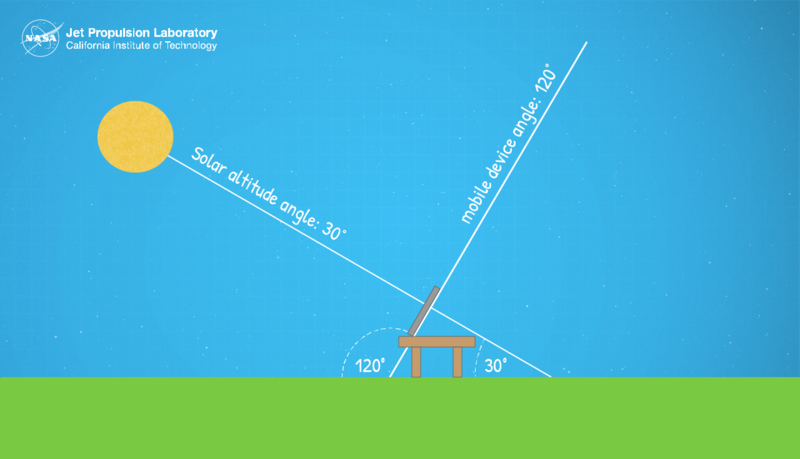 This can be accomplished by creating an obtuse angle with the phone and a flat, level surface that is the measure of the Sun altitude angle plus 90 degrees – See Procedures, Step 4. Depending on the number of available mobile devices, students can work individually, in pairs or in small groups. The eclipse will last between two and three hours, depending on your location. Factors such as the length of class periods and bell schedules may require you to split this work between classes. Solar energy is radiant energy that is produced by the Sun. Every day, the Sun radiates an enormous amount of energy. The amount of solar energy a place on Earth receives depends on several conditions. 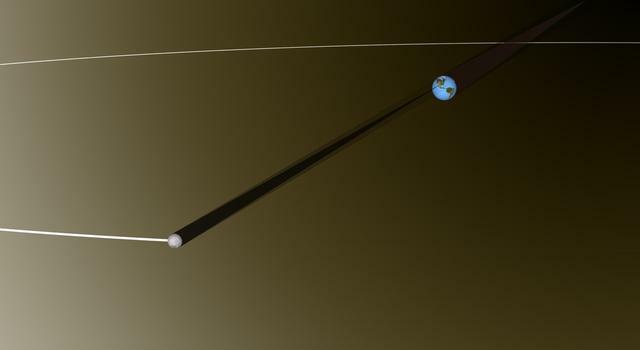 Mostly, it depends on latitude (as it relates to the season of the year, the angle of the Sun, and the amount of daylight hours), but it also depends on the clearness or cloudiness of the sky. Like clouds, a solar eclipse, whether total or partial, will block sunlight and reduce the amount of solar energy that reaches the ground. The amount of light that falls over a given area is measured in lux (equal to one lumen per square meter) and can be measured using the light sensor on a mobile device. By measuring lux during an eclipse, students can compare the reading to measurements taken of the full sun to see what impact a solar eclipse has on the amount of solar energy received on Earth. Using the interactive eclipse map, have students zoom into their location and click to create a pin. The pin popup will contain the eclipse start and end times in UT, totality start and end times if your location is in the path of totality, the solar altitude angle (alt), and the azimuth (the direction from north, expressed in degrees) at each of those times. (To convert from Universal Time to your local time, subtract four hours for EDT, five hours for CDT, six hours for MDT, or seven hours for PDT.) It will also provide the percentage of the Sun eclipsed if your school is outside of the path of totality. Have students fill out the first table on the Eclipse Measurement Data Sheet with data from the interactive map. On the day of the eclipse, have students use a lux meter app to measure the brightness of the Sun at the six times specified on the data sheet. To maintain the proper angle of the device during measurements, students may use a book with the cover propped at the correct angle for each reading, or another student-designed tool. Once the device is at the proper angle, students should launch the lux meter app and point the mobile device’s light sensor toward the Sun. To get the most accurate reading, indicated by the highest lux measurement, students may have to slowly rotate the device side to side. The lux reading will rise as they rotate toward the most direct sunlight and fall as they move past it. Some apps provide a record of the highest lux reading, making it easier to find the proper position. Optionally, if students are familiar with compasses and compass degrees, they can use the azimuth data to point the device with the correct orientation. If students use this method, remember azimuth is measured from true north, not magnetic north. How did your percent of full brightness calculation at maximum eclipse compare with the percent of the Sun eclipsed by the Moon data gathered from the interactive map? Compare your lux measurements with other groups. Are they the same, close or very different? What do you consider “very different” or “close”? What might account for those differences in measurements? Converting lux to watts per meter squared is a complex calculation that involves knowing color temperature and wavelength, but there is a simplified approximation for sunlight – multiply your lux measurement by 0.0079 to determine watts per meter squared. How is knowing the amount of solar energy received in a location useful? Why is it important to know how an eclipse, or more commonly cloud cover, factors into the use of renewable energy sources? Student data sheet answers will vary based on location. Ensure students correctly recorded data from the eclipse map, and correctly calculated the light sensor angle and percent of full brightness. 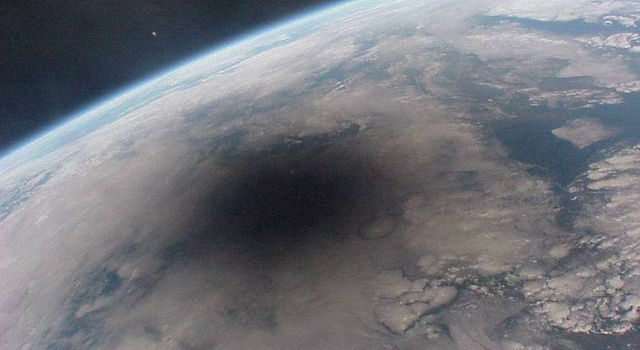 Teachable Moment: "Get Students Excited About Science With This Month's Total Solar Eclipse"
Think Green: Utilizing Renewable Solar Energy – In this lesson, students calculate incoming solar radiation and determine how much solar panel coverage would be needed to power the school.